Ted gets a telephone call from the producer of a television show called Faith of Our Fathers wanting to interview him for an episode about priests who work in remote areas. 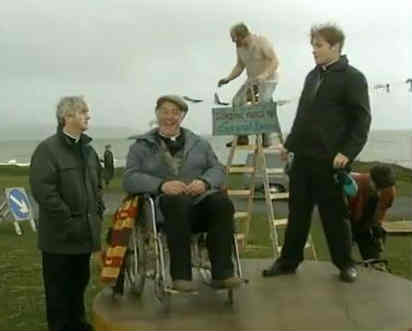 Ted tells the producer that he is the only priest on Craggy Island as he doesn't want the other priests, Dougal and Jack, involved. When the producer reaches the island he telephones Ted for directions. Ted tells him to make his way to The Field by asking Tom, one of the islanders, for directions. When Ted arrives at the Field he sees that the fair FunLand is on, something that Dougal desperately wanted to go to. Dougal is already there. 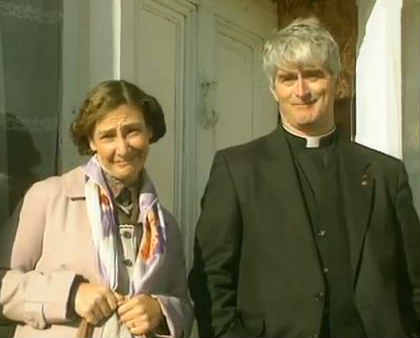 Ted wants to know why he isn't walking Father Jack along the cliffs. Dougal replies, somewhat oddly, that the cliffs are closed! When Jack runs off, Ted goes off to look for him and ends up joining hin on the Crane of Death, a fairground attraction. Meanwhile, Dougal has been mistaken for father Ted by the television crew and gives a disastrous interview whereby he draws into question the whole idea of organised religion. Later, back at the parochial house, Ted, Dougal, Jack and Mrs. Doyle, the housekeeper, watch the sorry mess on television. Father Jack hurls a bottle of liquor at the screen to show his displeasure. Father Dougal: Spider-Baby- It's got the body of a spider, and the mind of a baby. Father Dougal: Come on, Ted. Sure it's no more peculiar than all that stuff we learned in the seminary, you know, Heaven and Hell and everlasting life and all that type of thing. You're not meant to take it seriously, Ted! Father Ted: Er, well, we'll talk about that later, Tom. Right now, I'm going to be on the telly! First appearance of Mary and John who sell their wares at FunLand. Dougal once rode on an eighty year old man's back for an hour. Dougal confuses his dreams with reality. Dougal and Father Ted sleep in the same room. Dougal doesn't know the lord's prayer. Dougal has shaving foam all over his face although he never shaved that morning. Jack likes girls, especially when they are playing volleyball with their tracksuit tops off. Jack doesn't like taking mass. Jack doesn't like the television turned on when he is asleep. FunLand consists of The Ladder, Freak Pointing, Whirly-Go-Round, The Pond of Terror, Goad the Fierce Man, Car Rides, Spinning Cat, The Crane of Death, Duck Startling and The Tunnel of Goats. Craggy Island has no landmarks. Nuclear waste (or glow-in-the-dark as Ted calls it) is dumped close to the island. The first episode received two complaints after it was broadcast; one because it was thought to be too anti-Catholic, the other because it was thought to be too pro-Catholic. A crewman can be seen spinning the Whirly-Go-Round with his hand on the right side of the screen when Jack and Dougal are on it.